Life of Lou: Traditional Pavlova! Today I'm sharing a super traditional Australian dessert and one of my all time favourites. 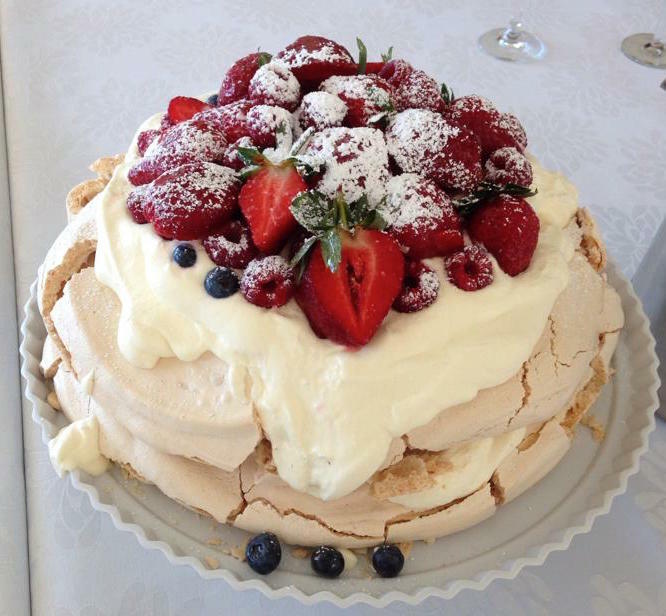 Pavlova is a meringue for all my non- Aussie readers ;) And is a huge hit in both my home country and house! My mum has been using this recipe for 30+ years and it is a family favourite. Treat yourself this weekend with a piece of this summer delight! lunch she attended last weekend! Preheat oven to 180°C. Line a baking tray with baking paper and draw a 20 cm circle on the paper. Beat egg whites and salt until satiny peaks form. Beat in sugar, a third at a time, until meringue is stiff and shiny. Sprinkle over cornflour, vinegar and vanilla and fold in lightly. Mound onto paper-lined baking tray within circle, flattening top and smoothing sides. Place in oven, immediately reduce heat to 150°C and cook for 30 minutes. Reduce further to 120°C and cook for 45 minutes. Turn off oven and leave pavlova in it to cool completely. Invert pavlova onto a platter, pile on cream and decorate with fruit!